Be a part of the Ram Family! Welcome to Angelo State University, listed by ThePrinceton Review as oneof the Best 384 Colleges for 10 consecutive years! Come explore thecollege experience with ASU’s exciting culture, modernized campus,and thrilling education. Find outwhat it means to be a member ofthe Ram Family. • Academic scholarships from $1,000–$15,000, with an additional $3,000 available to Honors students renewable up to a total of four years. At Angelo State, we offer our students the best of the best. With more than 100 majors and concentrations to choose from, your career options are unlimited. 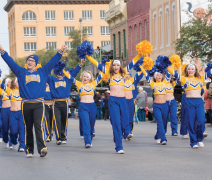 Angelo State also hasover 100 student run clubs and competitive athletics for men and women. Student groups here are not only active, but they excel. 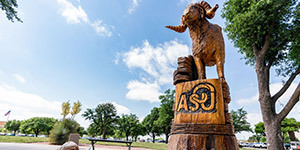 When you enroll at Angelo State,you won’t just be another collegestudent on campus, you’ll be an active member of the Ram Family. Most students are just looking to attend college for the four-year undergraduate experience. Students likeyou plan ahead for the possibility of what you can achieve. Check outAngelo State, where we’re the perfect place to not only complete your degree but also prepare for and get intograduate school. • Our students excel: 95% of Engineering and Physics students whoapply are accepted to graduate school; 98% of students who apply are accepted to veterinary students; 53% are accepted to medical school (the national averageis 42%). • We have more than 100 majors and concentrations to choosefrom, including dozens of graduate programs. • 41% of all undergraduate students receivethe largest academic award in Texas,the Carr Scholarship, awarded based on academic achievements.You could earn anywhere from$1,000–$15,000 per year. • Join the ASU Honors Program, which will give you an additional scholarship worth $3,000 per yearand prepare you further. With these opportunities to reduce debt, you’ll be able to plan ahead and pursue success in graduate school.The success rates speak for themselves—our graduate and professional school acceptance rates are higherthan the national average. Don’t settle at just getting into college. Make an investment in your future by choosing Angelo State, where you’ll excel far beyond the first four years. Add Angelo State to your college list today!